Well, it is not actually a “vintage laundry” find . . .
~ ~ however, it is something that I wanted to place in the laundry room . . .
~ ~ ~ ~ to showcase my “vintage laundry” items. These items were on the counter where I fold clothes . . . I believe that using an item such as this stool . . .
~ ~ is a solution to “how to create visual interest”. A basket containing more vintage laundry items sits to the left of the stool. And more pretties on the right. A place for lost socks . . . where do they go? . . .
~ ~ to the “lost socks abyss”. So happy that I found this stool (also with Mary Alice’s help) at the Liberty Antiques Festival. Love this addition to my laundry room!!! On another note. . .
You may have seen me write about my “Sewing Group” . . .
~ ~ where we sometimes B – T – H and Stitch. A group of 8 of us ladies in our neighborhood….and one of these ladies, my friend Pam . . .
~ ~ is a fabulous quilter. Well, her quilt made the cover of a juried Quilt Show Brochure. 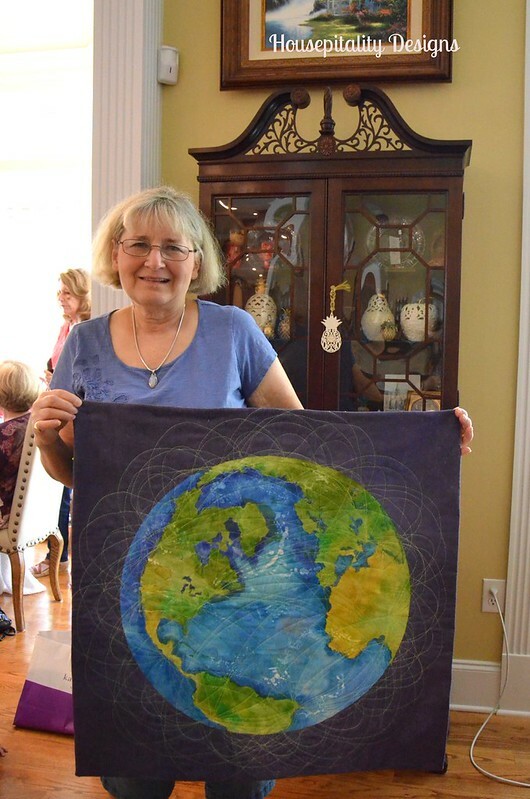 A gorgeous quilt that she hand painted and quilted. 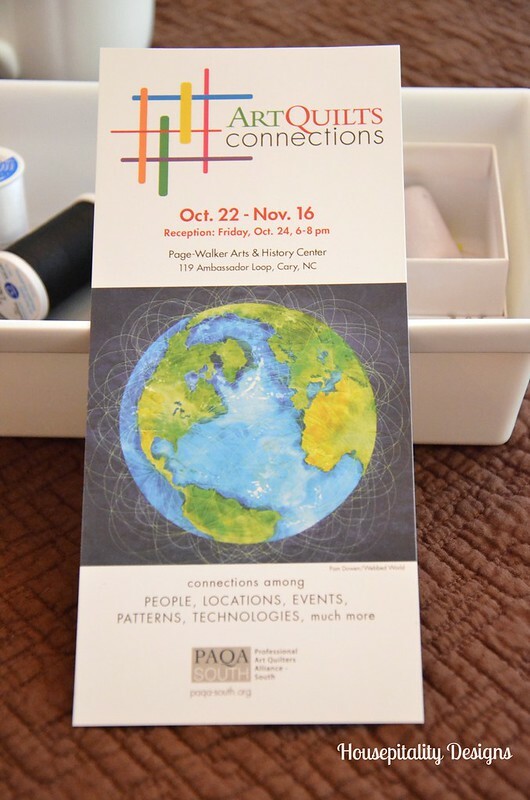 So if you love quilts . . . . and live in the Cary, N.C. area . . .
~ ~ then this is a must see showcase of gorgeous quilts (especially my friend Pam’s) ! ! ! Have a great weekend!…….I will soon have guests arriving . . .
~ ~ stay tuned as many of you will know them!!! We will be off to the High Point Fall Market. Love your old goodies. The stool is perfect. Yay, for Mary Alice again. Can’t wait for Market! 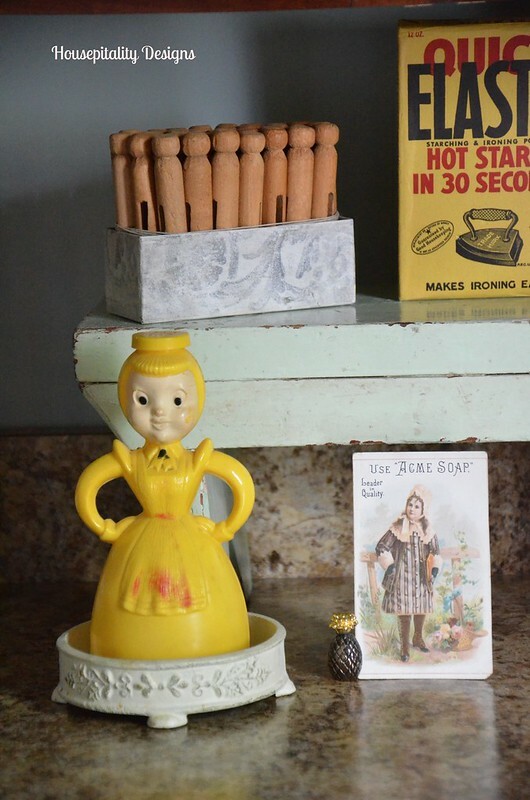 Shirley, I’ve always admired your vintage laundry items – so fun, especially the little yellow laundress. I’m guessing she is a “spritzer?” I remember when it was my job to sprinkle clothing that needed ironing (ours was a giant 7Up bottle with a special sprinkle-type cork), roll them up and put inside a special bag to wait for ironing day. Waaay before steam dryers! The quilt is amazing! Congratulations to your friend. 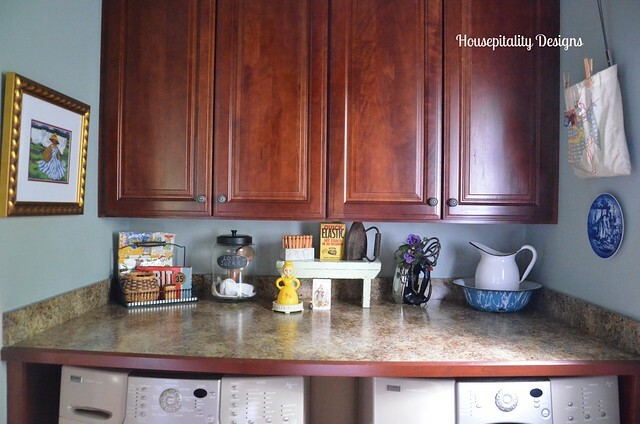 Even the laundry room looks cute in your home! Fabulous quilt made by your friend. What a beautiful quilt your friend made! Have a fun weekend with your guests…hope you find lots of goodies!! Cute vintage laundry items. The stools are always a great find – love the color on this one. If you ever tire of it, I have some jadeite that would sure look cute on it. 😉 Have fun at market! hey…who’s coming over to stay in your gorgeous guest room? have a good time at high point. This is such a cute room! I love your vintage accessories! The stool is perfect to showcase your treasures! 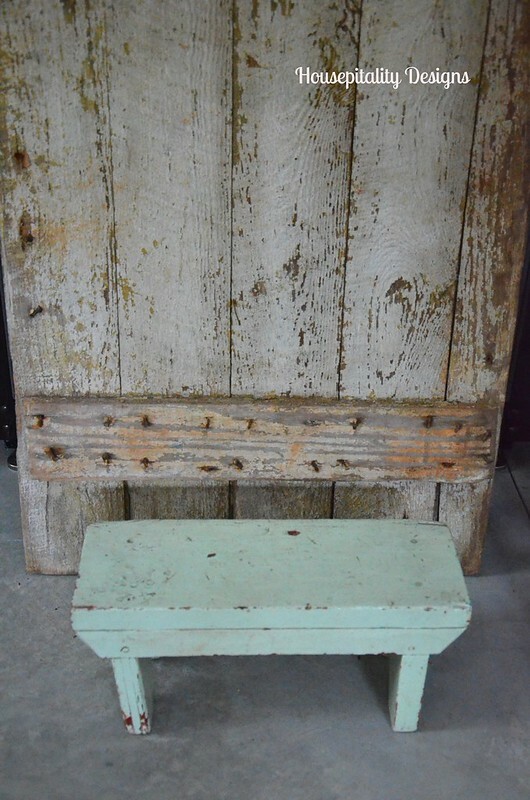 I just purchased a vintage milking stool for the beach and can’t wait to play with it there. Thanks for the inspiration! I love Pam’s quilt; it’s stunning! She’s very talented! Oh how fun! Another outing…can’t wait to see what you bring home! Congratulations to your friend! Stunning quit! Another cute room Shirley…must look for a small stool…..note to self lol. Shirley…the close pin bag reminded me of my maternal grandmother. I would help her hang clothes outside on the clothes line when I was a kid. Pre dryer days! Yes…I am that old! Ha! Hi Shirley, your laundry room display is darling. Love that little bench. Perfect addition to your collectibles. Your friends quilt is gorgeous. What a talent. I wish I was in Cary to attend the show. My best friend lives there. A walk back in the past. Very stunning. I would love to go to that quilt show. i got an amish quilt while in Lancaster, PA and we love it. 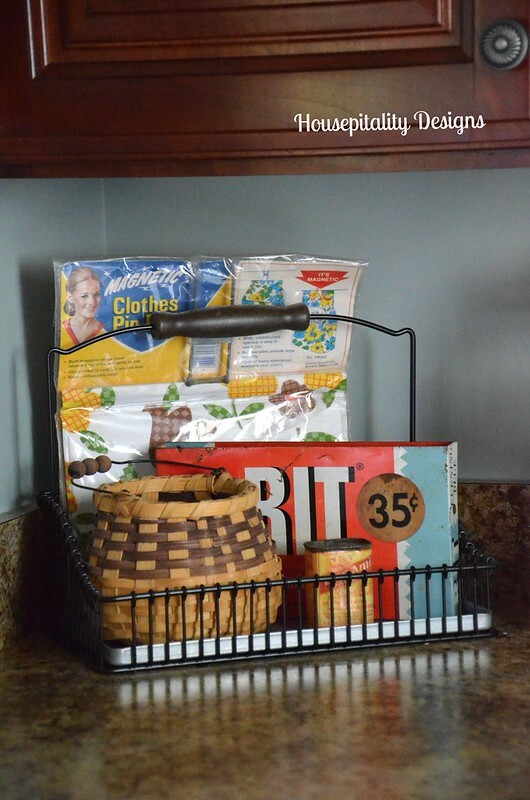 Love your treasures for your laundry room – they look great. Your friend Pam is very talented lady – great quilt. Have a wonderful weekend with friends and treasure hunting. You have so many great vintage accessories, Shirley! My lost sock bin is the drawer beneath the dryer. Funny how the mates never show up! Great ideas. I have an old iron also. Good idea to display it in the laundry room. Mine is crammed in the storage room. It is very old. 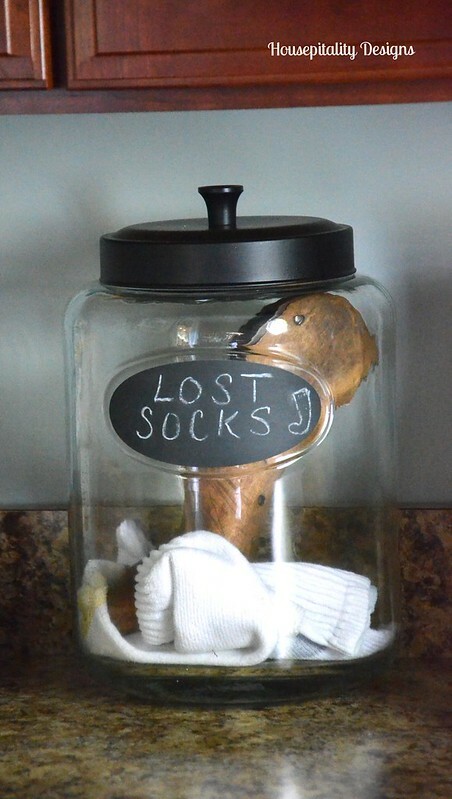 Love the lost sock jar. Cute and needed. What a gorgeous quilt! 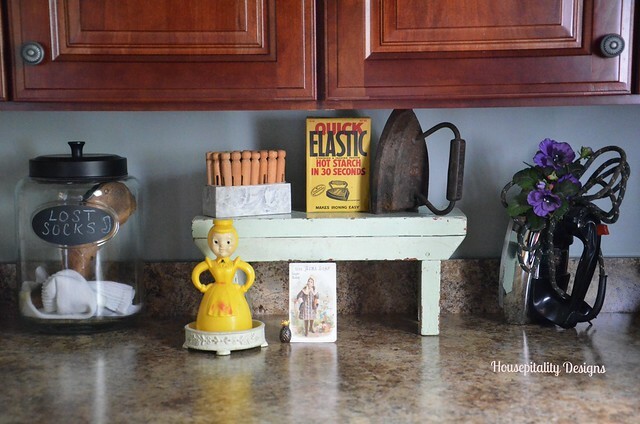 That little stool is perfect on your counter holding those vintage items, Shirley! I love the color. Shirley- That is a really cute little stool. Love your sock jar. For Halloween you should change it to LOST SOLES~ lol I have my Gramma Stella’s little cast iron that she actually used to iron with back in the early 1900’s. I love it. I wish when I had designed my laundry room I had thought to add a niche for her old treadle sewing machine but I missed it- too much going on. That’s such a great way to use that stool. You have so many cute old fashioned laundry items. My mom used to have some of those old black irons. They are heavy too! I love your cute vintage items in the laundry, the little stool adds the perfect height. I love your little stool Shirley and it looks perfect in your laundry room. 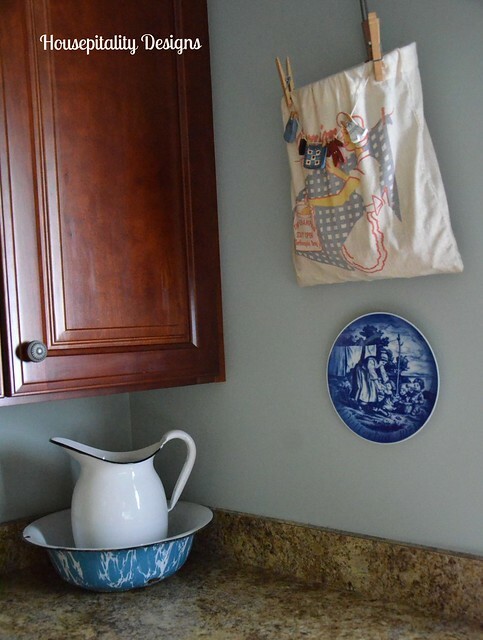 I have decorated my laundry room with vintage items as well. You have some very cute items! Sweet stool Shirley to showcase with your vintage laundry goodies! Enjoy your time in HP! I was there yesterday but unfortunately it was for a funeral for my BFF’s mother. Mary’s recent post…The Witch Is In: Halloween Cauldron Cupcakes! I need a lost socks XXL basket! 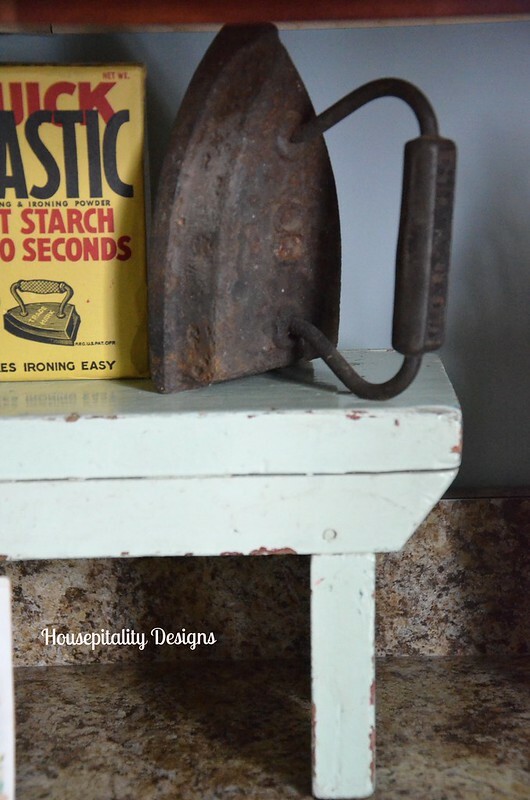 Love your vintage find laundry – makes laundry fun to do – almost! Hi Shirley, Your laundry room is darling, your lost socks jar made me laugh!And that quilt your friend made is unbelievable! She’s so talented! You really have a wonderful laundry room! I have what is more of a laundry “closet” and don’t have the space to do anything like this, but I love looking at yours. You find such cute things, and then you totally know how to put them together! This is so nice Shirley…what I wouldn’t give for a real laundry room. Mine is in the basement! Your vintage touches are perfect. Have a blast at the High Point Market too! As much time as is spent in the laundry room, I think it’s a good idea to have it be a place you enjoy spending that time. 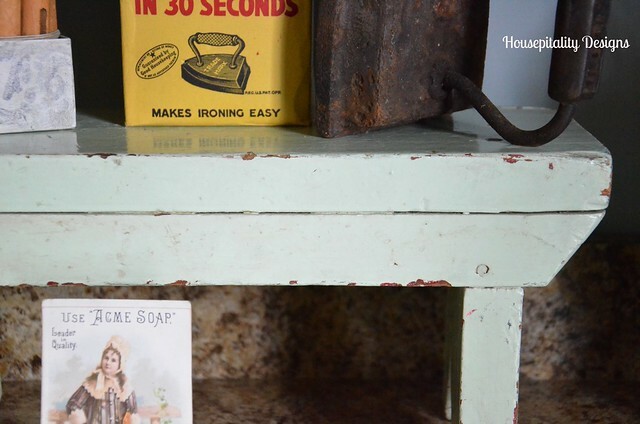 Love all of the vintage finds in your laundry room. The sock jar is too cute except at our house I would need a much larger jar. I love quilts and your friend Pam’s is absolutely gorgeous, I will have to go check out the show. Have a great weekend! Love all your finds Shirley! That little stool is darling.